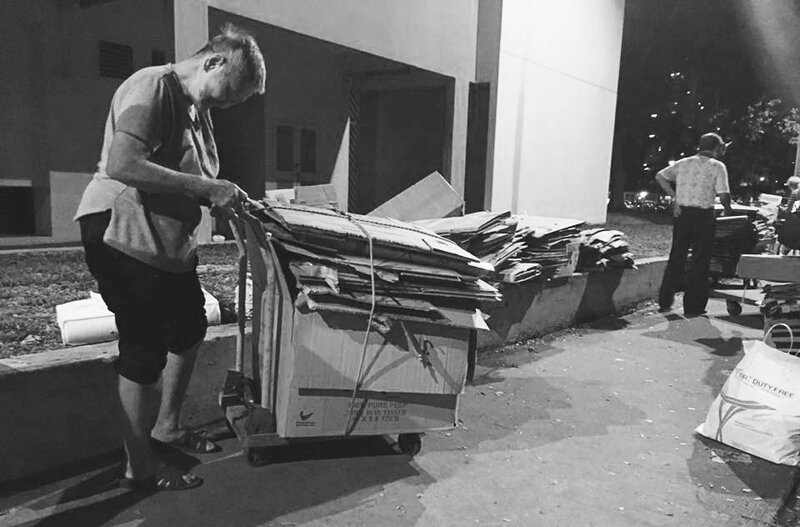 Almost every month since March 2016, the non-profit group Happy People Helping People Foundation has been raising funds for the benefit of elderly cardboard and can collectors with GIVE.asia's help. The funds raised are used to purchase a daily meal for each of their 100-plus beneficiaries, in the respective estates that they work or stay in. The remaining money is used to provide $50 NTUC vouchers for the collectors, and fund outings to places such as the Singapore Flyer and the Duck Tours. Each beneficiary gets a Happy Friends Card every month, with which they are able to redeem their daily meals at the respective food stalls. Usually mixed vegetable stores are chosen so the beneficiaries are able to pick from a variety of dishes every day, of which they can collect at their own convenience so the meals can be consumed while warm. On the first Sunday of every month, the group conducts Happy Sunday, where they distribute the Happy Friends Card and vouchers to their beneficiaries. The group also encourages donors to come down to the outings or Happy Sundays to hand out their vouchers personally, to encourage interaction with the beneficiaries. Helmed by 36-year-old Nafiz Kamarudin, Happy People Helping People Foundation was started in 2013. The group settled on helping elderly cardboard and can collectors, as many tend to fall through the support network provided by the government and society. When asked about his motivations for his actions, Mr Kamarudin spoke of his wish to provide his beneficiaries with financial and emotional support. He also brought up his wish to encourage compassion for others within the public. Happy People Helping People Foundation has raised over $234,000 so far on GIVE.asia, usually recieving over $10,000 per monthly camapign. The group is currently active in five different estates in Singapore - Toa Payoh, Little India, Chinatown, Bedok and Geylang. They employ the help of volunteers by informing them of the monthly events and outings through their Facebook page.